PyroBill - CRM and more! PyroBill is a Customer Relationship Management web application, but it doesn't stop there. Start with talking to prospects; end with receiving payment from your customers. PyroBill has you covered. Keep track of who is interested in your products & offerings. Complete Prospect and Customer information management. Compose branded Proposals for your customers. Create Contracts based on Proposal, previous Contracts, or from scratch. Enter Charges in each Contract. Send Invoices to your Customers. Finally, track Payments from your Customers. PyroBill is designed to support efficient and reliable business processes. Efficiently track all of your business in one place. We offer cost effective concurrent use licensing. Configurable options and custom fields to match your business processes. Includes features to show you which customers have outstanding balances and tools to help you collect. Plus, we can further customize PyroBill to add any features or reports you want. PyroBill has a wide variety of features designed to help your business prosper. Collect contact information about Prospects and Customers. Create a unique Customer Abbreviation for easy reference throughout the system. Efficiently track Customers' interest in your products & offerings. User definable fields can be configured to fit your business. Create Activities for scheduled meetings, phone conferences, or tasks. Easily create well formatted Proposals. Break a Proposal into sections to improve comprehension or offer multiple options. PDF Proposals allow for maximum portability and reliable printing. Proposals easily convert into Contracts for billing. Create Proposal Items from a company-wide set of Proposal and Contract Items. Create different Proposal templates for your products and offerings. Contracts are a foundation for Invoicing and receiving Payments. Contracts can contain Contract Items, which function as a library of work items for a Customer. Ability to associate a Purchase Order Number with a Contract to fulfill government ordering requirements. Contracts use a simple enumeration scheme that makes it easy to find Contracts and Invoices. Ability to create Contracts based on previous contracts. Each Contract Charge is assigned to a Contract. They are ultimately responsible for what is billed to customers. Use Items from the selected Contract Items or company-wide Contract Items to quickly enter Charges. Company-wide Contract Items lead to consistent Proposals, Contracts, and Billings across all Customers. Auto-complete Contract Charges based on the Contract Item. Choose the billing rate, unit, and quantity for each Charge. Assign each charge to the Employee responsible. Search for existing Charges within Contracts. Categorize Charges for dual-entry in QuickBooks. Create Invoices in bulk or one at a time, whichever fits your business. Choose which Contract Charges go on Invoices, or let PyroBill select them automatically. Configuration options let PyroBill automate repetitive actions, like filling in the Invoice Date and selecting Contract Charges. Print envelopes for mailing your Invoices. PyroBill is able to charge Customers late fees for unpaid Contract Charges at an interval and rate of your choice. Show the Customer a history of all Invoices with unpaid balances. Age Invoices at a rate you choose. Give Customers the bottom line for how much they owe. Receive Checks, Cash, or Credit Cards. You decide which Invoices, Contracts, and Charges get paid, or let PyroBill do it for you. View the Invoice associated with each paid Contract Charge. Powerful querying and reporting features. Query by custom date ranges, or use one of the preset options like "last 30 days" or "year to date". See Active Customers with graphs for historical perspectives. Show each Customer or Prospect by the assigned Employee. Full Text Contract Charges Search. An Invoice Summary report shows whom you've invoiced, for how much, and when. Payments Received report aids with bookkeeping. Customers with Unpaid Charges in Open Contracts helps manage delinquent customers. Edit available options in drop-down lists on-the-fly . Define and capture data in custom fields for Customers, Prospects, Contacts, and more. Use your letterhead on Proposal, Envelopes, Invoices, and Statements. Configurable business rules are easily adapted to match those of your business. Call (866) 684-3669 to talk to a PyroBill representative to find out more about PyroBill. Got questions? Check out the Frequently Asked Questions (FAQ) below. If you have more questions, please feel free to request more information. In one sentence, what is PyroBill? PyroBill is a system to automate, track, and report on your business. Can I compare planned costs to actual costs? Yes! PyroBill offers reporting right on the Contract Charge screen that shows you the Contract budget compared to your billed Contract Charges. How long can my Contract Items, Contract Charges, and Proposal Item Descriptions be? PyroBill supports about 1,600 words per Item Description. Need more? We can customize your PyroBill implementation to support much longer Item Descriptions. What sort of Year to Date reporting does PyroBill offer? PyroBill has Year to Date reporting that compares the current year to the previous year and offers projections based on that data. What other reporting does PyroBill offer? Customer and Prospect Lists per employee. Active Customers Report with sparkline graphs. Payments Received and Allocation Reports. Don't see a report you need listed? Let us write it for you. Can I customize fields for prospects? Yes! PyroBill lets companies configure a whole range of custom fields for Prospects, Customers, Contacts, and Products. If we don't have a field that meets your needs, we can add it. Can PyroBill do bulk Invoicing? PyroBill offers both bulk Invoicing and Statements. With Bulk Invoicing, you can optionally pick which charges are on each Invoice before the Invoice is finalized, or you can let PyroBill do the work for you. Can I choose which Contract Charges are Invoiced? Of course. There are two different configurations with Bulk Invoicing, one of which lets you choose which Contract Charges are Invoiced, the other lets PyroBill pick for you. If you create a stand-alone Invoice, you have the option of selecting which Charges appear on the printed Invoice. Is PyroBill a QuickBooks replacement? No, PyroBill was designed to complement QuickBooks, not replace it. How is PyroBill different than Sales Force? PyroBill has CRM components like Sales Force, but it has special focus towards IP Law Firms, Consulting Companies, and other companies providing services. It goes beyond Sales Force with its Contract and Billing features. Where do I download PyroBill? PyroBill is a web-based application. All you basically need is a fast internet connection and a modern web browser. What exactly is a concurrent user license? Concurrent user licensing is a way to save our customers money by only charging for the number of users logged into PyroBill at a given time, rather than for every PyroBill user account created. Licensing is paid on an annual basis and includes hosting, system updates, documentation, and support during the licensing period. Licensing is per user, so you should be licensed for the maximum number of concurrent PyroBill sessions you will need. What sort of customizations can be done to PyroBill? Add new modules such as a knowledge base module tailored to your industry. Integrate with your accounting software. Or simply add extra fields to screens. PyroBill was written by Inspironix, a custom software and consulting company in Sacramento, California. We designed PyroBill to meet our needs and those of similar companies and law firms. Have more questions? 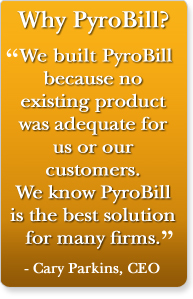 Call (866) 684-3669 to speak with a PyroBill representative today! PyroBill runs on our web servers at a secure data center so you don't have to worry about hosting your own web server, and backups are handled for you! We license PyroBill per concurrent user per year. Please call a PyroBill representative toll free today at (866) 684-3669 for a quote or request more information. PyroBill is a flexible environment designed to meet the needs of your business. Your PyroBill consultant can provide you with a quote that includes licensing for your company and customizations to make PyroBill the ideal system for your business. Integration with your existing systems. Customized layout of your Invoices, Statements, and Proposals. New modules to handle your additional needs. Learn more about how PyroBill can help your business. Call 866.684.3669 to speak with a friendly PyroBill representative today!